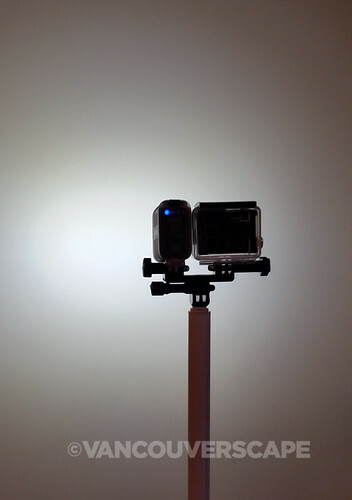 While GoPro video cameras are great for capturing outdoor action, it’s often hard to get good footage at night or in low-lit areas. I recently received a silver Knog qudos Action Video Light at CES, and this little powerhouse is ready to shine a light on your night and underwater adventures! 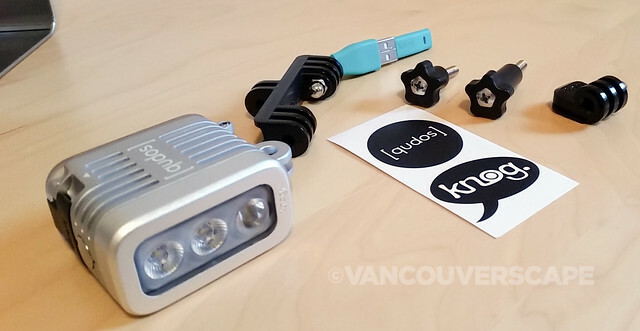 I’ve reviewed several Knog cycling products in the past, but hadn’t yet tried their video light. Until now. 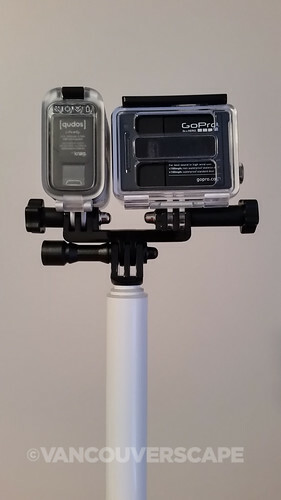 The qudos fits side by side with your GoPro right on its own mount (included in the box). 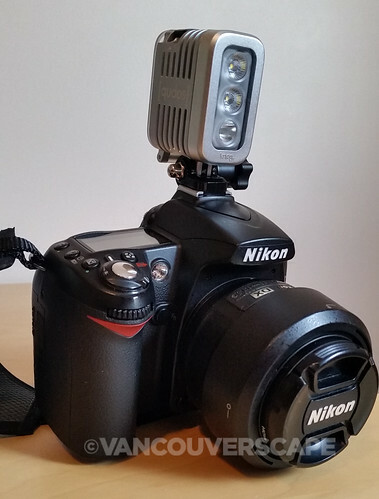 Along with a USB-rechargeable, replaceable Lithium Polymer (Li-Po) battery, qudos works with action cameras, digital SLR’s, and tripods. 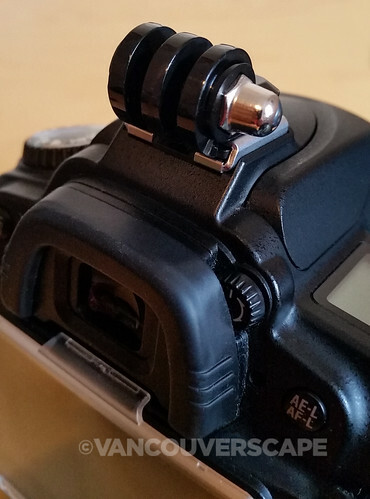 You’ll also get mount hardware (short and long), and two anti-vibration pads of varying sizes to place between the qudos and your camera as needed. The battery is accessed by opening the light’s back door. 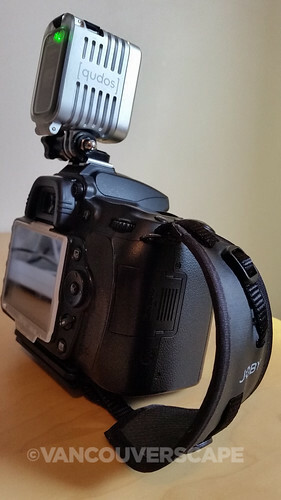 A USB cable then plugs right into the battery on one end and connects to a USB-powered source such as a laptop or USB wall charger on the other. 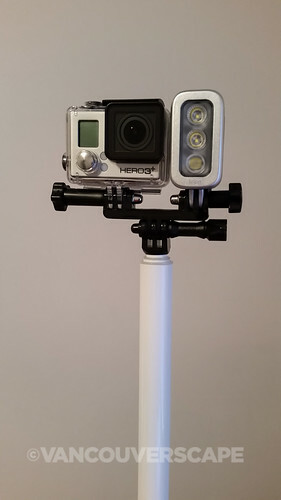 I charged mine using GoPro’s own wall charger (a full charge takes about five to six hours). 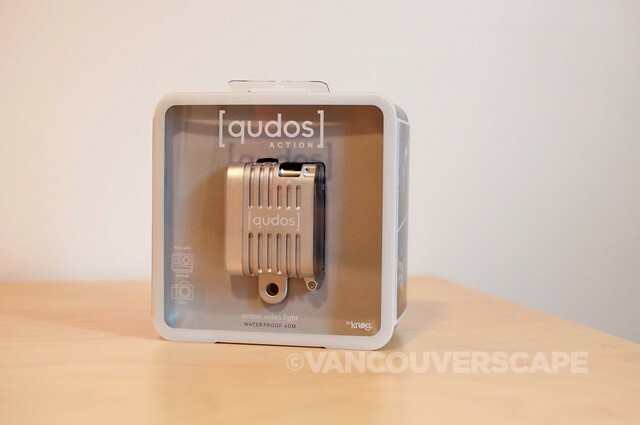 Comparable to using a bike light, the qudos cycles between six settings/three modes at the press of a button on top. Choose wide (400/225 lumens), target spot/narrow (155/100 lumens), and ultra-wide/ambient (270/70 lumens) beam angles, with recharge times dependent on how many lumens you put out in your video session. A maximum of 400 lumens power three CREE LED lights. The beam angle ranges from 72 degrees wide to 45 degrees narrow. The icons on the top rear of the light refer to the three mode options: Action, Target Spot, and Ambient. A fourth icon on the far right indicates battery level. When the light is not used for extended periods (over two weeks), you can set the battery level to Storage Mode to preserve battery life. Once you’re ready to use it again, just fully recharge it. 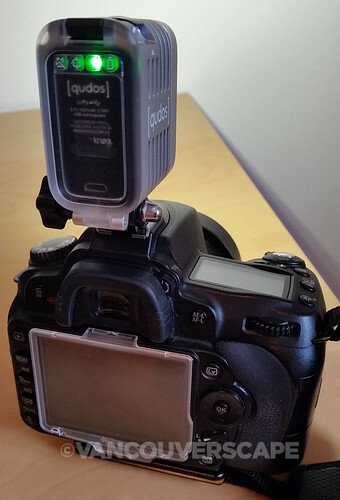 While I got the qudos to easily mount onto my DSLR shoe (with the provided cold shoe adaptor), I was more interested in seeing the results with the qudos and my GoPro Hero3+. Here’s the YouTube-uploaded video, showing my recent creepy/foggy beach walk along Vancouver’s Kitsilano Beach. And while the video I shot isn’t necessarily compelling subject-wise, my aim was to see how well the light would hold up to a very dark night. The rocks show some pretty decent detail (I was using the XShot Pro GoPro mount with both camera and light mounted onto it, held a few feet above the sand). Water lovers: get excited. With its sealed rear battery door, this little baby (150 grams/5.29 oz) is waterproof to 40 meters (131 feet)! 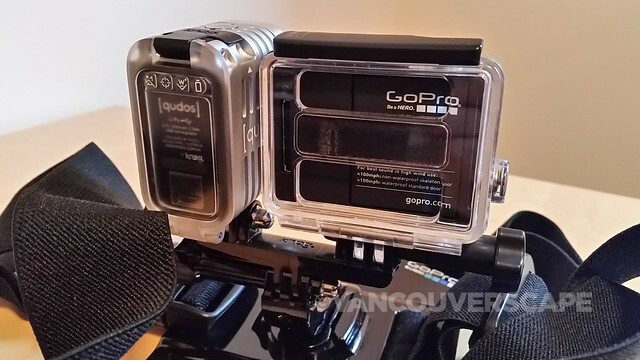 Available in either Midnight Black or Bulletproof Silver, qudos is compatible with GoPro 2, 3 and 4. 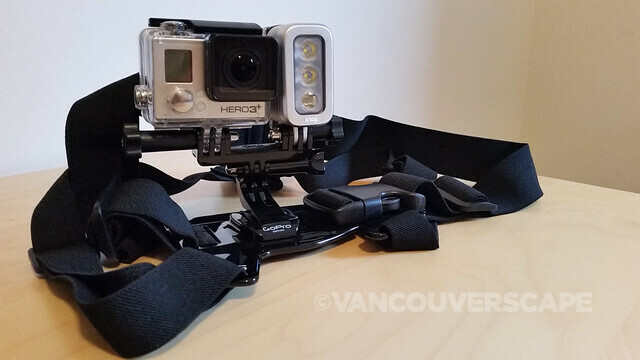 It will also work with Sony action cams, Garmin VIRB, or any action camera with a GoPro conversion mount. I’m looking forward to snorkeling with the qudos and my GoPro Chesty mount and hope to include a link to some of my footage here in the future. 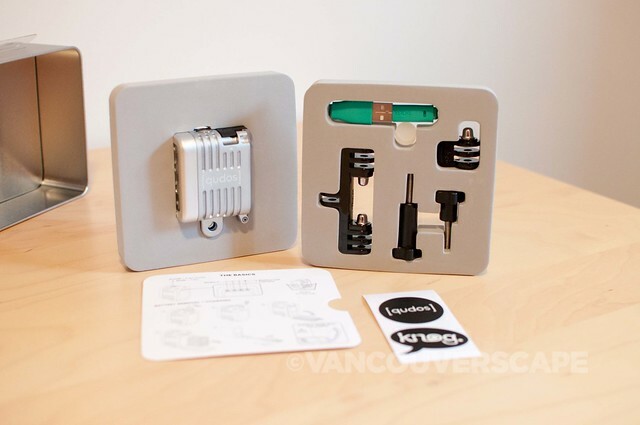 Knog’s qudos retails for US $119 and is available online. 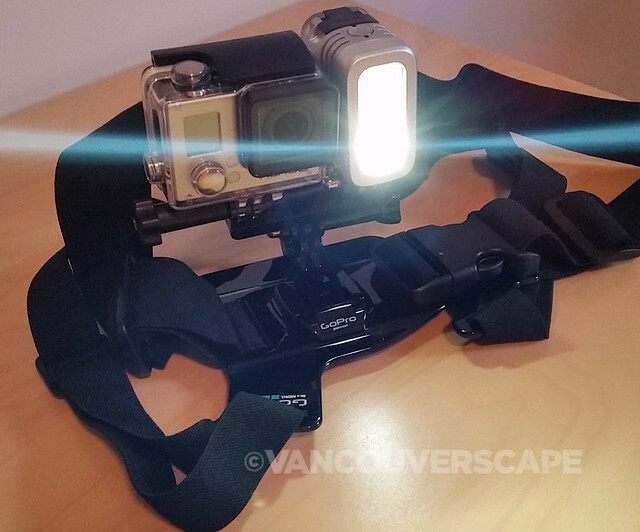 Pre orders are now on for the Expose Smart, a high-powered video light for iPhones. CES 2015: And That’s a Wrap!